Description: Call of Duty®: Advanced Warfare envisions the powerful battlegrounds of the future, where both technology and tactic have evolved to usher in a new era of combat for the franchise. Delivering a stunning performance, Academy Award® winning actor Kevin Spacey stars as Jonathan Irons – one of the most powerful men in the world – shaping this chilling vision of the future of war. Power Changes Everything. 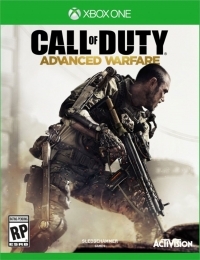 08-15-2015 scar04c Description Call of Duty®: Advanced Warfare envisions the powerful battlegrounds of the future, where both technology and tactic have evolved to usher in a new era of combat for the franchise. Delivering a stunning performance, Academy Award® winning actor Kevin Spacey stars as Jonathan Irons – one of the most powerful men in the world – shaping this chilling vision of the future of war. Power Changes Everything. This is a list of VGCollect users who have Call of Duty: Advanced Warfare in their Collection. This is a list of VGCollect users who have Call of Duty: Advanced Warfare in their Sell List. This is a list of VGCollect users who have Call of Duty: Advanced Warfare in their Wish List.